Registration, although NOT required for data access, is required for data entry. In the case of multiple entries, the user’s submissions are all tied to one account reducing submission time and if interruptions to the submission process occur, information can be stored and completed later. 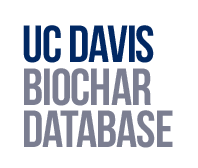 Copyright © 2019 UC Davis Biochar Database. All Rights Reserved.